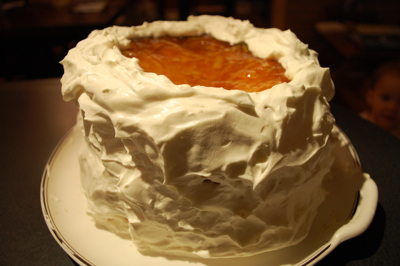 You will never believe what came out of my oven yesterday: Esther Bollick’s famous 3-layered orange marmalade cake. You know how it is. After spending so much time in Mitford, a girl just has to find what the fuss is all about! So, I report on the fuss. Here’s why they must all love it: A peculiar, yet endearing sour cream frosting compliments the sweet orange marmalade quite well. Not to mention, this must be the moistest cake in town. Add to that the pure love that goes into squeezing fresh orange juice, and drizzling into cake-holes and the artistry of plopping thick frosting all around the tall layers… Besides, it just looks like a force to be reckoned with. I used the recipe out of my beloved copy of Jan Karon’s Mitford Cookbook and Kitchen Reader: Recipes from Mitford Cooks, Favorite Tales from Mitford Books. But, I also found it online for you!